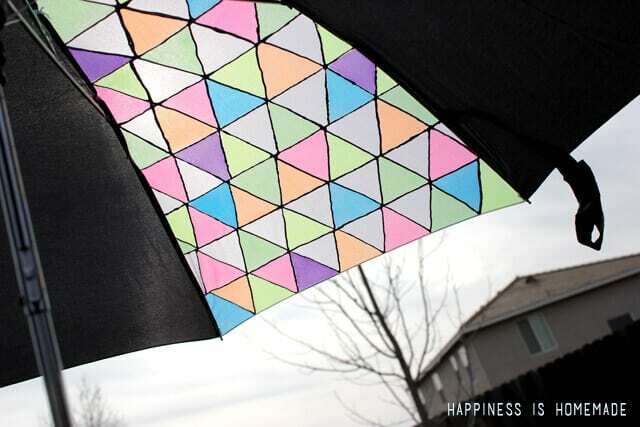 DIY Geometric Umbrella – Get Your Neon On! Grey winter days can start to feel blah and dreary after awhile, and some parts of the country have experienced more than their fair share of gloomy days this year. February always makes me anxious for spring to arrive, and I anticipate those first bursts of color as baby leaves unfurl and daffodils peek out from the cold ground. 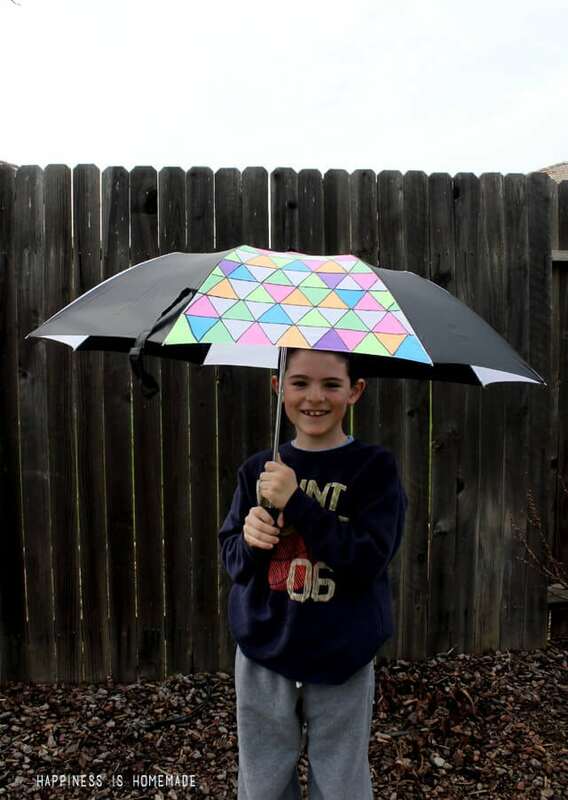 A couple of weeks ago, we were smack in the middle of a heavy rainstorm when I received a box of goodies from iLovetoCreate.com that was full of bright neon colors – perfect for chasing away those cold winter blues! 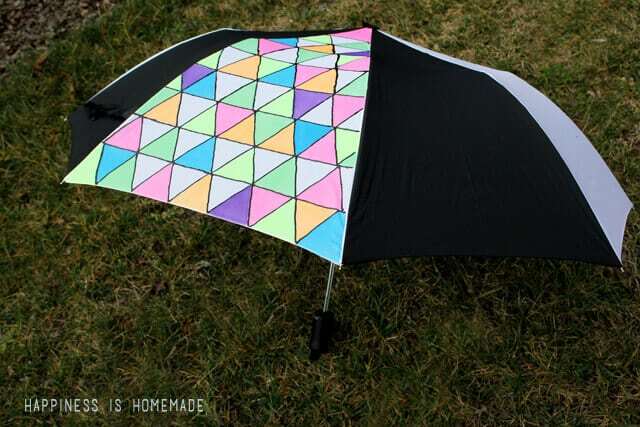 I knew right away that I wanted to embellish my boring umbrella with some bright pops of neon color that would tide me over until those spring flowers arrive. You can pick up these exclusive Tulip products (along with the exclusive Tulip One-Step Mini Tie-Die Kits) at your local Michaels Arts & Crafts store. For those folks without a Michaels store in their area, you can order the products at iLoveToCreate.com. iLoveToCreate.com is currently offering free shipping on any neon Tulip product for the month of February when you use coupon code NeonFEB (ends February 28th). 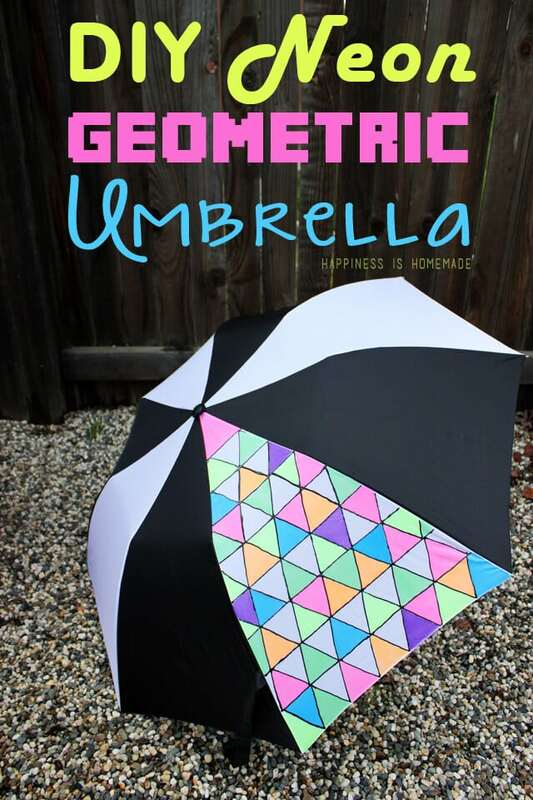 I decided that since I was using neon colors, I wanted to create a throwback 80’s style pattern on my umbrella. 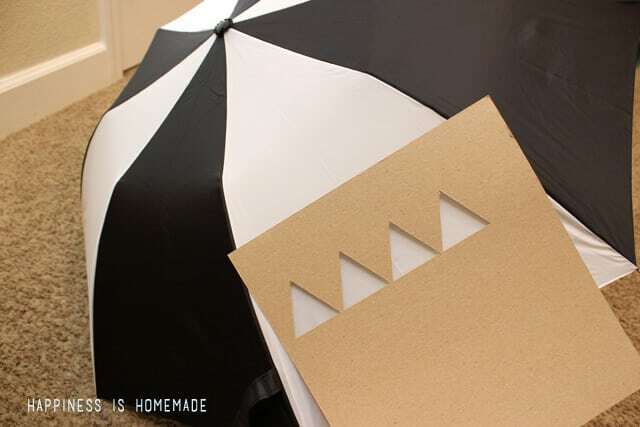 I cut a geometric triangle template out of a piece of chipboard, and I used a pencil to lightly trace my design on to the umbrella panel. I traced over my pencil lines with slick black Tulip Dimensional Fabric Paint and allowed it to dry overnight. 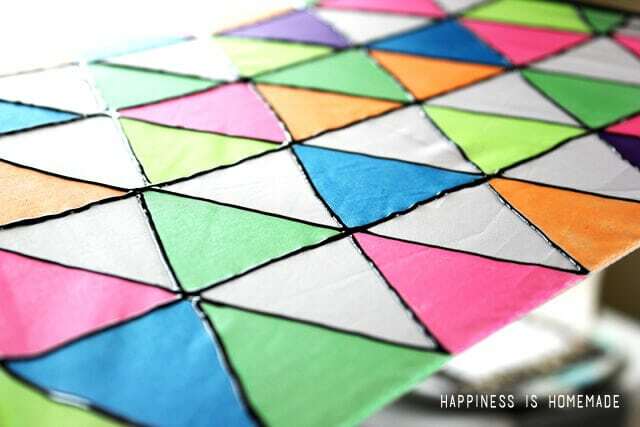 In the morning, I got out my brush tip Tulip Neon Fabric Markers and started filling in the triangles with randomly placed color. 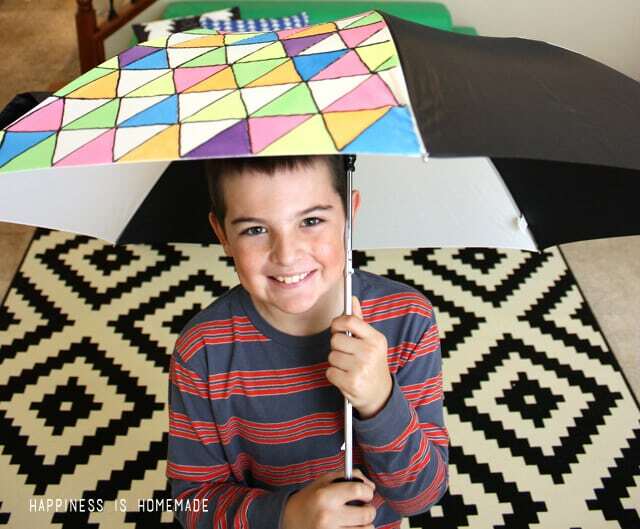 It didn’t take long before the kids discovered what I was making, and they quickly claimed my new umbrella as their own! I love the way that the light shines through the panel and reminds me of bright stained glass. My original plan was to have just one single neon panel as my splash of color, but the new plan is to do another one on the opposite side too. Honestly, I kind of want to do ALL of the panels because it’s just too much fun! Maybe I’ll even let the kids help next time. 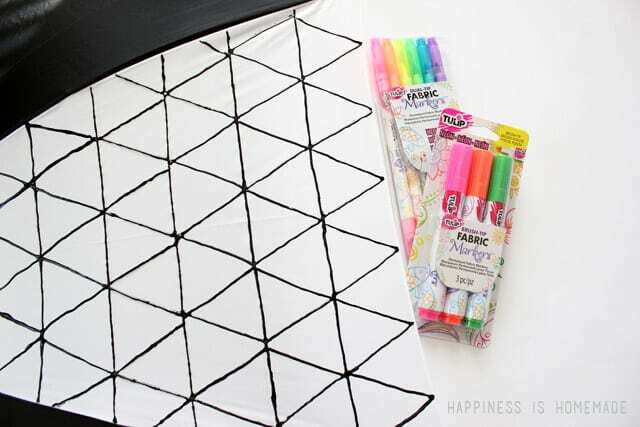 For more great neon ideas, check out these totally awesome projects from some of my friends, and be sure to follow iLovetoCreate on Facebook, Twitter, Pinterest and via their blog! Hi Heidi!! Oh how I love this idea!! The results are endless and I can’t wait to try it. Thanks for sharing!!! Super cute and fun. 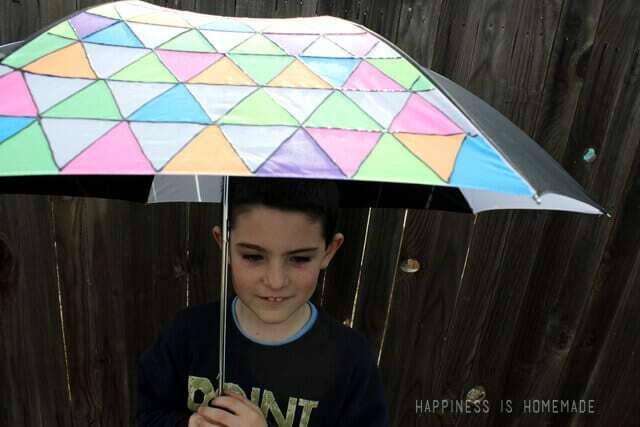 Best umbrella ever! I could really use that up here in Oregon! What a unique project- cool idea! So stinkin’ cute! I love the vibrant pop against the black and white. And of course those kids are adorable! Beeeeaaaautiful! Love it …. 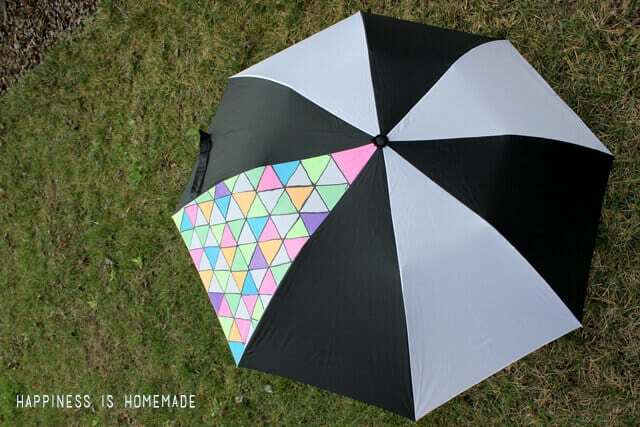 the colored pattern rainbow neon!Your umbrella is super cute!